They're some of world's greatest pilots, and they fly their machines to the limit every time they take to the sky. They're the Red Bull Flying Bulls, and they've been thrilling millions at air shows around the world since 1999. 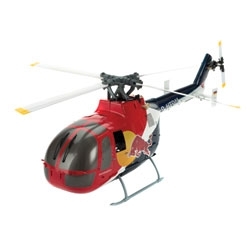 Horizon Hobby is excited to give you a taste of flying like the Bulls with the officially-licensed Blade® Red Bull BO-105 CB 130 X RC helicopter. Capable of scale flying, and superior aerobatics the Red Bull BO-105 CB 130 X delivers nearly the same breathtaking spectacle as the full sized Red Bull BO-105 CB. With the Red Bull BO-105 CB 130 X, you get both an impressive scale model and an unrivaled aerobatic flying experience that only Blade can deliver. ** This helicopter is intended for expert CCPM pilots only.